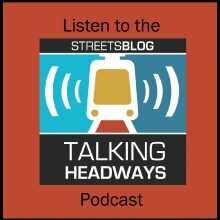 You can find all the Talking Headways Archives at Streetsblog USA. You can support the Podcast by going to our Patreon Page. 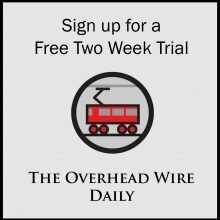 The Overhead Wire is a consulting firm owned and operated by Jeff Wood in San Francisco California. Jeff’s focus is on sharing information about cities around the world with advocates, elected leaders, researchers, and other interested parties. The Overhead Wire is also the owner and operator of The Overhead Wire. 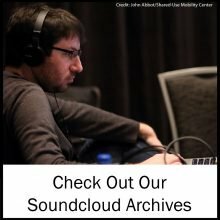 Projects include podcasts, news sites, cartography and data analysis, and research on transit modes and land use strategies. In 2006 we started collecting articles of interest for folks in the office. That turned into collecting articles for the Reconnecting America board and then an email list that was shot off to members. 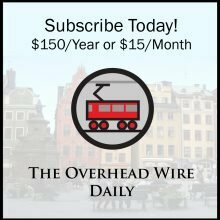 The email list has grown now to more than 1,800 and folks who like to receive news articles about issues related to cities. As the group who wishes to receive the emails continues to grow, we didn’t want to feel like we were spamming people or leaving them out by not making the list available to more people. Additionally, we wanted to be able to archive articles and allow people to search for older news without fumbling back through emails. And if you miss a day, you can find two days at once in each subject area. The site is called The Overhead Wire because that’s what we hope to do. Transfer information and knowledge to you. We know that sometimes it’s like drinking from a fire hose, but this becomes a window through which we can see what’s going on in cities around the world on any given day. And as busy as we all are, five minutes each morning is all it takes to skim over the list. Happy Reading. This is the website of The Overhead Wire. We collect only a limited amount of information about the usage of our website: the type of IP address of visitors, time of access and specific web pages visited. We use this information in the aggregate solely to help us better target content to our users, for example, we track which pages are most popular among visitors as a whole. Some of the non-personal data collected may be stored and compiled into reports by a third-party traffic analysis service provider that we utilize, Google Analytics. You may read about their privacy policies at their Privacy Center. Should you send us an e-mail with a question or a comment, we may use your personal information in order to respond to your questions or comments. We may also keep your comments or questions for future reference. This is the only instance in which we get in touch with a user on an individual basis. We will otherwise not release personal information about you or your account except comply with any valid legal process such as a search warrant, subpoena, statute or court order. And although we always strive to protect our users’ privacy, we cannot guarantee the security of information you provide us. You disclose information at your own risk. We reserve the right to change this policy, and you will be bound by its most current version.